Prop Alex Allan has signed a two-year professional contract with Glasgow Warriors. 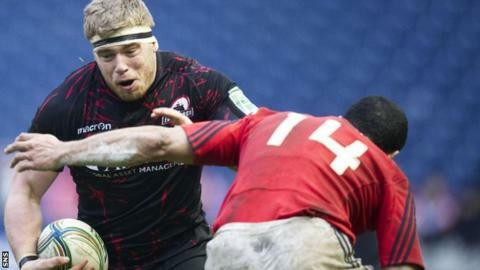 The 22-year-old, who has been part of Edinburgh's elite development squad since 2012, will join the Warriors this summer. "It's a great opportunity to continue my development," said Allan. "I'm ready to work hard and make the most of it. "I'm delighted to have signed a professional contract with the Warriors." Allan has represented his country at various age group levels and won his first Scotland A cap against England Saxons in January. Glasgow head coach Gregor Townsend was thrilled to secure the services of Allan, who made the first of his five senior appearances for Edinburgh against Munster in the Heineken Cup last season. "I believe we've secured a player with real quality, who is young and hungry to learn," said Townsend. "Alex was a stand-out performer at age-group level and has developed over the last couple of years. "He is exactly the type of player we want to bring to the club and will add competition to our front row next season."